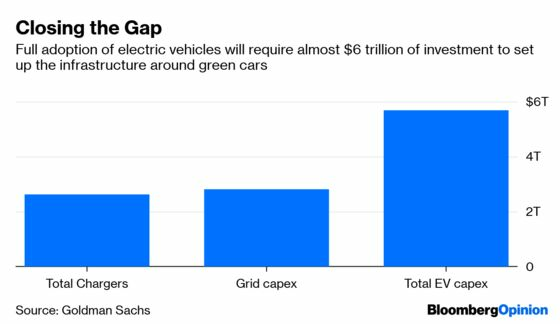 (Bloomberg Opinion) -- China is moving to close the $6 trillion cost barrier to the widespread adoption of electric cars. As part of its much-awaited new energy policy, China on Tuesday rolled back its subsidies and imposed tougher performance requirements for electric vehicles. Beijing’s outlays will be reduced by around 60 percent, after an initial transition period that lasts until June, while local-government handouts will be terminated. This provincial funding now will be redirected to charging stations and other related infrastructure construction. These measures were more severe than expected. If local governments don't comply, the statement warned, the central government will cut fiscal subsidies. Charging infrastructure is arguably the largest cost barrier to the adoption of green cars. As we’ve written, an estimated $6 trillion of such investment is needed globally. Chargers account for almost $2.6 trillion of that, while capital expenditure on grids including upgrades and new connections comes to $2.8 trillion. Implementing these advancements is expected to take decades. That Beijing is doubling down, and directing its efforts where they’re needed, is commendable. These measures are necessary to achieve cleaner air and wider usage of green cars. Ensuring high standards and economically viable infrastructure for electric cars will be key. The government also will have to eventually figure out how to make charging infrastructure commercially sustainable for private operators, without getting companies hooked on subsidies – an all-too-familiar problem. The gargantuan costs aside, the availability of public-charging infrastructure is an important factor in car-buying decisions. People understandably want to know how far their cars can drive before recharging. Less than 40 percent of homes China have access to dedicated parking spots, according to a recent report by Columbia University’s Center on Global Energy Policy. Installing home chargers comes with the headache of paperwork and months of waiting. China currently has over 800,000 installed chargers, with more than half of those in tier-1 cities like Beijing and Shanghai. Beijing already has targeted 4.8 million charging posts and more than 100,000 stations by 2020. The existing policy even stipulates that new residential construction should be equipped with charging facilities, along with other requirements. 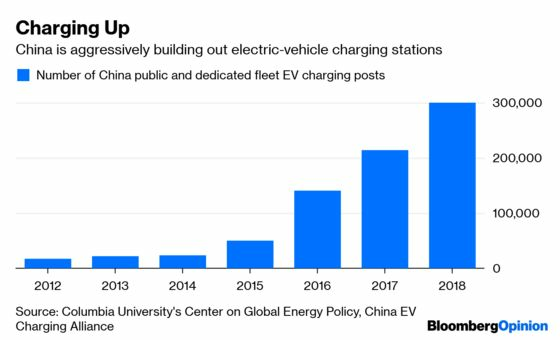 This is perhaps why the likes of China Evergrande Group are wading into electric cars. Globally, oil and utility companies are also buying up charging startups. 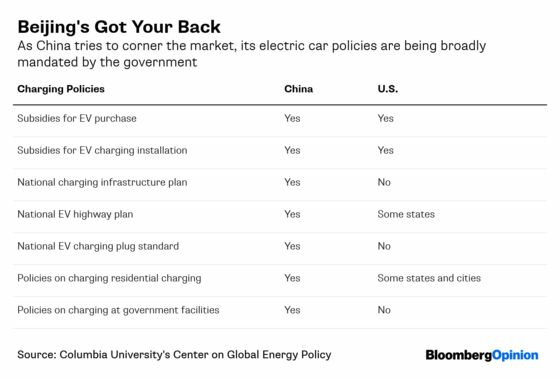 Over the years, Beijing has shelled out billions in subsidies and other incentives in a bid to dominate the electric-car industry. Sales have surged, even as the broader car market has slowed. At the outset, such handouts led to the mushrooming of small and questionable manufacturers. Later, the government started subsidizing battery makers, which birthed a national champion, Contemporary Amperex Technology Co.
China’s broader new energy policy takes a carrot-and-stick approach that has forced carmakers, through a credit system, to have electric vehicles comprise a portion of their sales. That has meant every auto company has to have a green-car strategy to operate in the world’s largest car market – whether or not it can afford to do so. The latest move will help raise the standards of a market that’s managed to churn out cars rapidly – just not necessarily ones consumers want to buy. To maximize their subsidies, manufacturers need to meet ever-higher standards. The likes of Nio Inc. and Great Wall Motor Co. will now have an even harder time luring buyers. But government handouts have managed to raise the bar. They may be a necessary evil for electric cars to take hold.